The folks at Razertip have come up with a new line of woodburning tips for bird carvers. I experimented with the newly designed Feather Former burning tips and am very pleased with the results. I tested three sets from the collection, #SET4FFCC Coarse, #SET4FFM Medium, and #SET4FFF Fine. 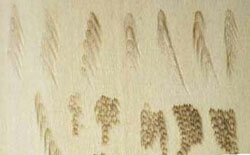 These sets allow you to woodburn a variety of feather textures. 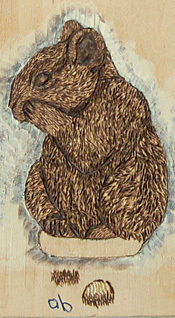 The most important concept of woodburning is to burn shallow. Many beginners make the mistake of burning too deep and end up with a coarse finish that is difficult to paint. These new tips inherently prevent burning deep. The tips emboss the surface rather than cutting it. The Feather Formers take a little practice to get a feel for them, just like any other tool. Take some time to experiment with them before burning on your carving. I get the best results using low temperature and light pressure. If you want a little darker burn at the tips of the feathers, use a slightly higher temperature while maintaining the light pressure. I found the skew to be a little unwieldy, but I easily bent the tip to better suit the way I hold my pen, producing the angle I needed. Both the skew and the chisel left small gaps between strokes, but those are easy to fill in with a burning tip of your choice. The tips tend to cool after several strokes, due to their large overall surface area, but it wasn’t enough to become a problem. With my burner, the Detail Master Excalibre, the wattage was sufficient to recover the heat relatively quickly–within a couple of seconds. Depending on the wattage of your burner, your recovery time may vary. Create a variety of textures with different shapes and grades of Feather Formers. I used the rounded tip most often. I burned most of the head, breast, and belly feathers of a miniature bluebird with the 52.05F fine round. With a little practice, it’s possible to burn several different-sized feathers with just one tip. You can create curved strokes with the round tip and go back in with a regular tip at a low setting to fill in more detailed burns, as I did on the head. If you make a mistake and place a feather incorrectly, the burn is shallow enough you can sand out the goof and reburn the feather. I often paint in extra details and these tips allow for fine painting details, such as cross-hatching, because they burn so shallowly.I used the rounded tip most often. I burned most of the head, breast, and belly feathers of a miniature bluebird with the 52.05F fine round. With a little practice, it’s possible to burn several different-sized feathers with just one tip. You can create curved strokes with the round tip and go back in with a regular tip at a low setting to fill in more detailed burns, as I did on the head. If you make a mistake and place a feather incorrectly, the burn is shallow enough you can sand out the goof and reburn the feather. Razertip offers a wide selection of sizes and grades to suit nearly every application, from Extra Coarse (40 lines per inch) to Ridiculously Fine (up to 240 lines per inch). I definitely give these new tips a thumbs up as another tool in my arsenal for forming feathers. The interchangeable burner tip sets are available for $29.95 each. Fixed-tip pens in each of the tip sizes and shapes are $34.95 each, and sets of fixed tip pens are available for $124.95. Contact Razertip at 877-729-3787 or visit them online at www.razertip.com.